Good morning, lovelies! While I would love to start in on fall sewing–warm sweaters, swirling skirts, and cozy coats, oh my!–it’s still dreadfully hot in Texas. As someone whose sewing is heavily tied to immediate wardrobe needs, that means summer clothes are skulking about my sewing room for a little longer. One of the pieces I’ve been plotting all season is a simple linen dress. I love linen on warm days, don’t you? It’s breathable, full of gorgeous movement, and often weighty enough to go unlined. Despite its notorious tendency to wrinkle, it’s also unquestionably elegant. Linen dresses bring to mind the wardrobe of Katherine Hepburn sailing down the river in The African Queen, or Kathleen Turner swinging on vines in Romancing the Stone: practical and resilient, but still so, so chic. I’ve actually ordered quite a bit of linen this summer, but my favorite length was this lush Medium Weight Linen from Mood Fabrics. 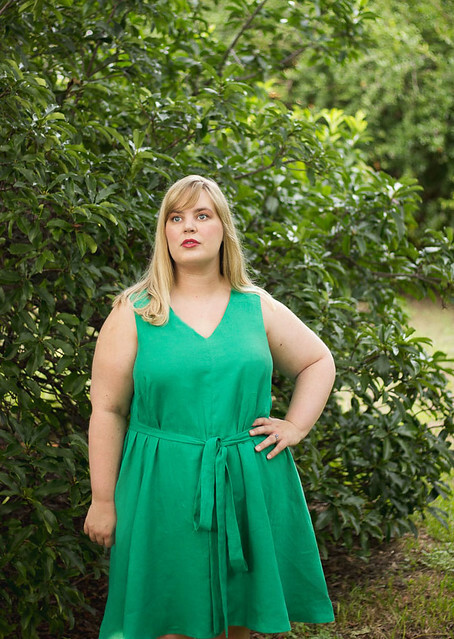 They stock it in over twenty colors, including this gorgeous, highly saturated emerald green. Right off the bolt, it’s on the crisp side and feels a little scratchy, but a quick wash transforms it into a baby soft fabric with plenty of drape. I’d originally planned on making a skirt with this yardage, but it was too cozy not to make a whole dress out of, instead. For the pattern, I wanted something casual, with clean design lines and a wide skirt. 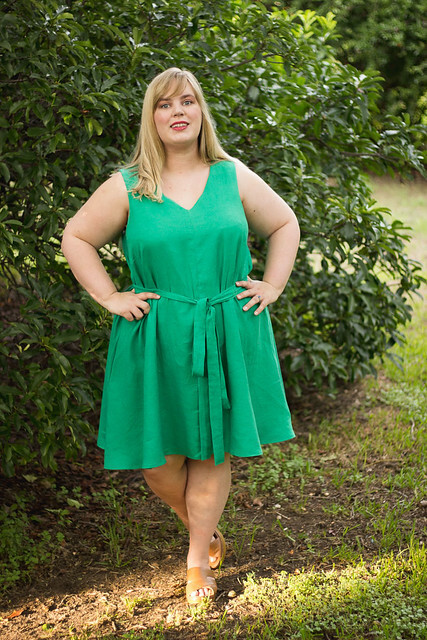 The Sway Dress, from Papercut Patterns, fit the bill perfectly. This is a classic tent dress, with two length options (mini and midi-length), a v-neck or scoop neck, super full skirt, and an optional waist tie. I’ve made it once before and loved how cinching the pattern’s waist mimicked a fit-and-flare silhouette, while still keeping all the loose, easy comfort of a trapeze dress. The circular skirt would also showcase this linen beautifully, allowing it to cascade and fold around the body. Before sewing this fabric, I washed and completely dried it three times, on the same settings I planned to use for the final dress. Those extra passes of washing ensured that the linen’s fibers were completely relaxed and that all the sizing had rinsed out by the time I sewed it up. This is a tip picked up from Carolyn’s blog and should help mitigate some of the fabric’s tendency to wrinkle. While I’m all about embracing wrinkles as part of linen’s charm, it’s nice to have some safeguard against the worst of them. As you can see in photos, there are still tell-tale creases in the fabric from wearing, but nothing overly distracting. Since this fabric is also on the heavier side of linens, I took some precautions when sewing with it, as well. Linens have the tendency to stretch out and warp, when manipulated too much. I handled the pieces minimally, stay-stitched every curve right after cutting my pieces out, and used stay-tape on the shoulders and light interfacing along the neckline seam. Otherwise, this was an easy project to put together. The whole dress has only four main body seams and the bodice is finished with all-in-one facings. I used a coordinating green bamboo voile for the facings, which gave a bit more structure to the neckline and shoulder area, and interfaced those with a lightweight fusible interfacing. Finishing the seams on my serger and without a closure in sight, it was a three hour project. Tops. The instructions for the Sway Dress have you hang the garment overnight, to let the bias parts of the skirt fall properly. Linen will stretch out even more than most fabrics, so I ended up leaving mine on the dress form for a full forty-eight hours, before hemming. After evening out the hem, I opted for a subtle high-low effect, to take advantage of the fabric’s drape a bit more. It was hard to pick up in pictures, but it adds an extra oomph to the swish of the skirt, when wearing. The hem itself is finished with a narrow machine hem, to preserve as much length as possible. Thanks to my height, the midi version of this dress hits right above my knees. I did make two changes to the pattern, apart from the hemline. First off, I did an FBA on the bodice, which added an angled dart at the bustline. I know it’s a tent dress, but this gave me the extra room required for my fuller bust, while keeping blousing to a minimum above my waist. I also doubled the width of the dress’s waist tie, to give it more impact. With a heavier fabric like linen, the thinner belt seemed out of proportion and like it wouldn’t cinch things properly. I love the look of the wider belt and will definitely keep that alteration in any future versions. Alright, so a bright green linen dress isn’t textbook Hepburn chic, but it suits me to a tee. The simple lines combined with its bold color make this a dress I’ve reached for over and over, in the past few weeks. With heels and a skinny leather belt, it works as a summery date dress. With flats and sunglasses, it’s a great dress for running errands on any afternoon. Plus, y’all, linen is seriously the best summer fabric ever. It breathes so well, especially in a swishy silhouette. I may wish for cooler days and eye coat patterns with envy, but this dress keeps me smiling in the Texas heat! Besides, if I need to sail through the jungle on an impromptu adventure, I’m set.